Iranian President Hassan Rouhani says the Islamic Republic will not allow the US’ wrong policies to affect its relations with the whole world. In an address to a joint meeting of Iranian and Austrian delegations in Vienna on Wednesday, President Rouhani described the Iran nuclear deal as a significant multi-national treaty which contributes to the global trust and said the Iranian nation has always stood against the illegitimate and unilateral moves of the US over the past decades. President Rouhani said Iran expects the EU to condemn the US’ unilateralism more explicitly and added in today’s world, the extra-territorial demands of one state is not acceptable at all, a report by Iranian President’s website said. He then referred to deep cultural commonalities between Iran and Austria and said the two countries enjoy a high status in Western Asia and the EU and can use the capacity for expansion of mutual ties. The Iranian president also pointed to the role of the Islamic republic in fight against terrorist groups in Iraq and Syria and said terrorism is a serious threat to the region and the whole world. In a joint press conference following a meeting of the two sides’ delegations, President Rouhani underlined that Iran and Austria are determined to expand their ties in various cultural, economic and political areas. He also underlined that Islamic Republic will remain faithful to the Iran nuclear deal only as far as its benefits are met under the accord. “The commitment needs to be mutual. Iran will remain in the JCPOA only if the remaining sides could guarantee its rights under the deal,” he noted. President Rouhani also stressed that Iran expects the European sides to remain as steadfast in economic area as it is in political area and added Iran and the Europeans can resolve their difference through cooperation. 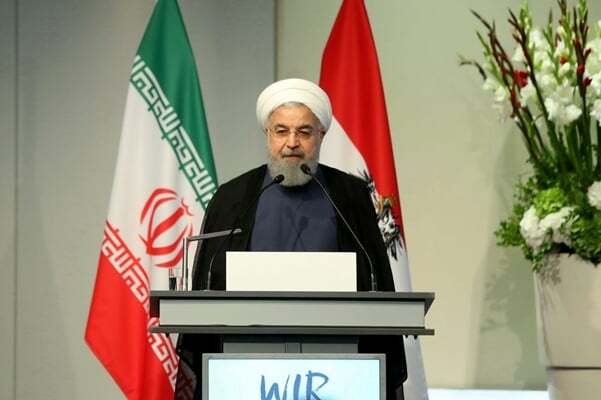 Touching on the regional crisis, the Iranian president said restoring peace and security to the whole region is in the interests of the whole world. For his part, Austrian President Alexander Van der Bellen said at present more than one hundred Austrian firms are active in Iran and added Austria and the EU are attempting to pave the way for further cooperation with the Islamic Republic. During president Rouhani’s visit to Austria, the two sides signed at least four Memorandums of Understanding in various fields including transportation and renewable energies. The Iranian president arrived in Vienna on Wednesday after his two-day stay in Switzerland.